List of all unreleased SMS games known or rumoured to have been in development. Thanks to playgeneration, Bock, adol, Tonto, kungfukid, dezaneube & Phil for additions, corrections & scans. 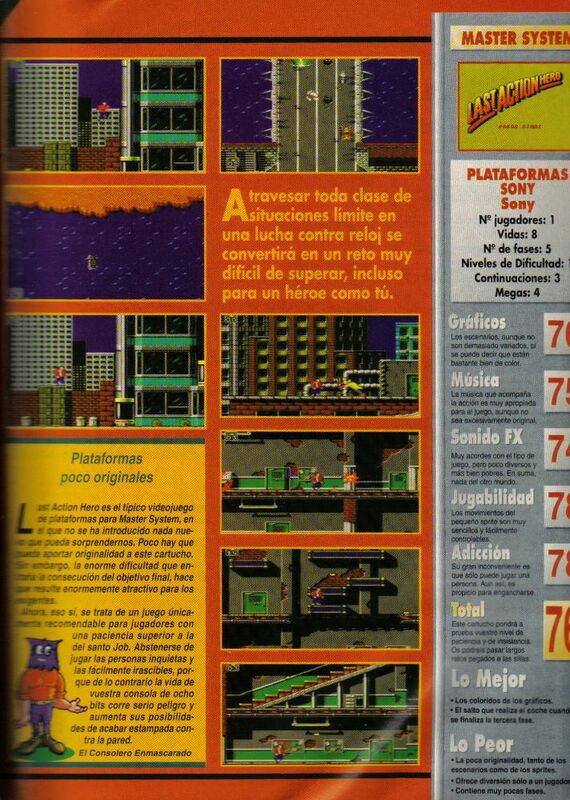 Listed in the "Master System: Les Jeux 1992 - 1993" booklet (scanned at SMS Power), also reviewed in Sega Pro (scan) alongside several screenshots. Game Gear version was released. 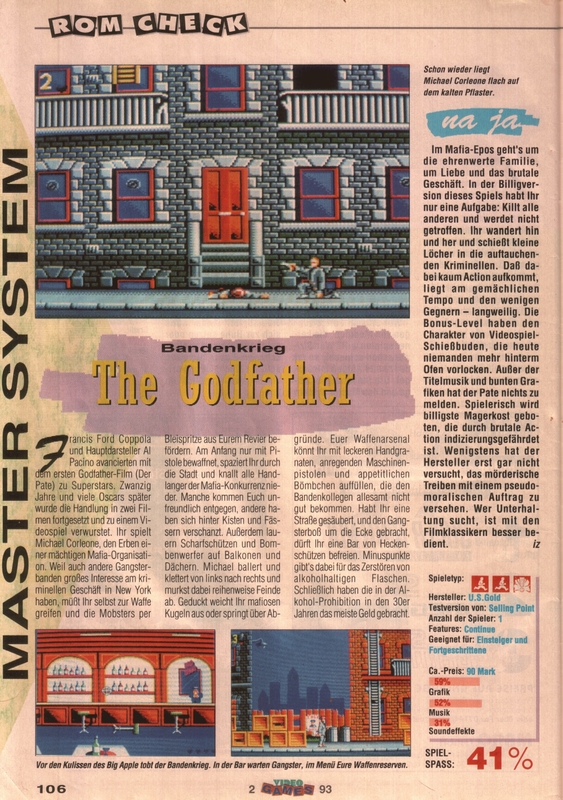 Listed as "coming soon" in "Master System Les Jeux 1992-1993". Game Gear version was released. 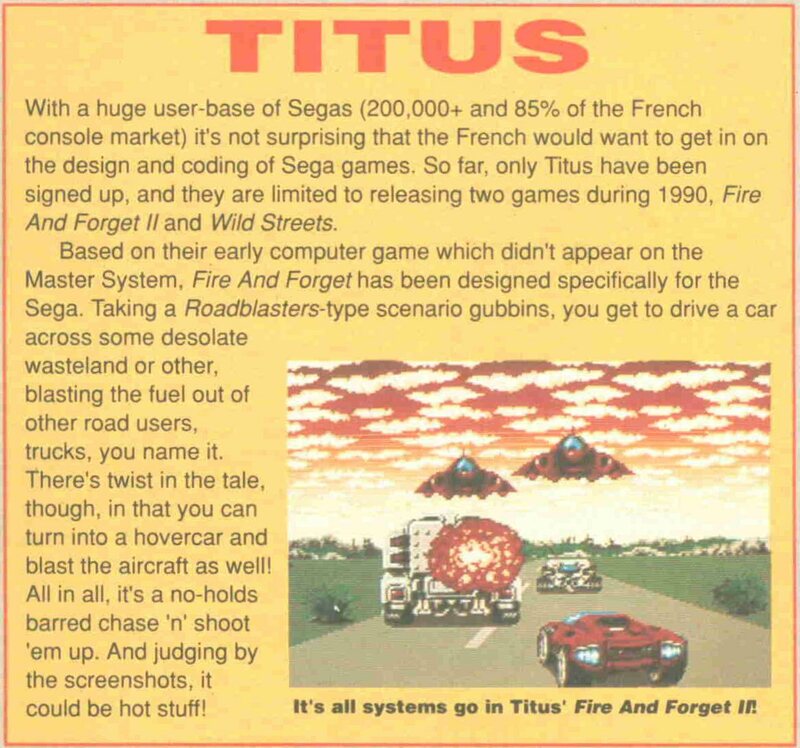 Mentioned in a 1994 French mag (mag? ?, issue ? ?, month ??) 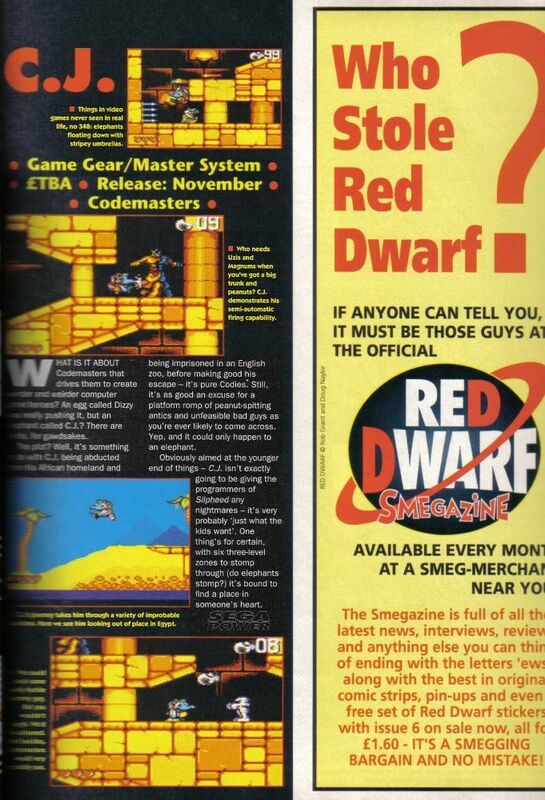 as being one of the last Master System games in development. 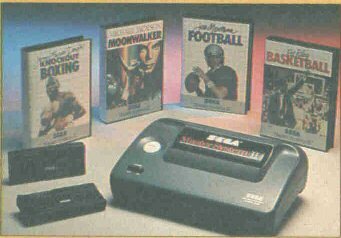 Mentioned on last page of Micro Machines instruction manual alongside several screenshots, and also previewed in Sega Power issue 48 (scan). Game Gear version was released. Reported as in development in issue 5 of Sega Master Force. Listed as "coming soon" in the 1988 Mastertronic catalogue. No further details known. Listed in "Master System: Les Jeux 1992-1993" and reviewed in issue 1 of Sega Pro (11/91) alonside a couple of screenshots (scan). 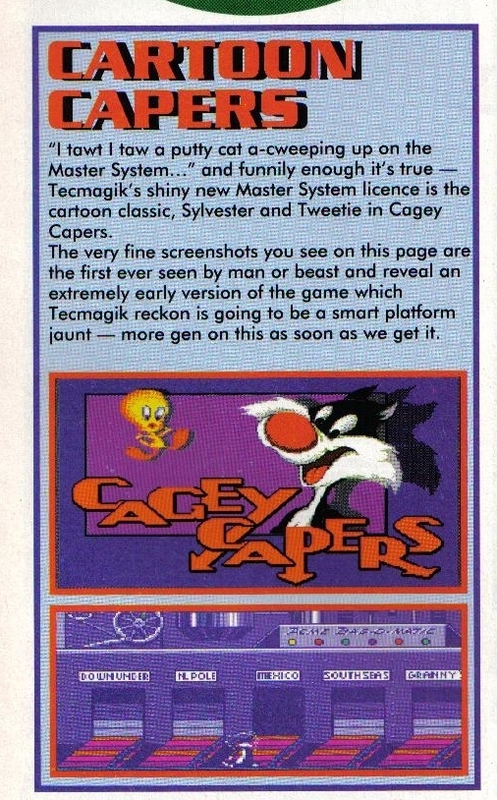 Reviewed in Sega Power (March 1994) (scan). Prototype owned, dumped & released by Bock. An interview with Dan Van Elderen, Tengen's Chief Operating Officer , in issue 5 of Sega Master Force (11/93), states that SMS, MD & GG versions of this were planned. 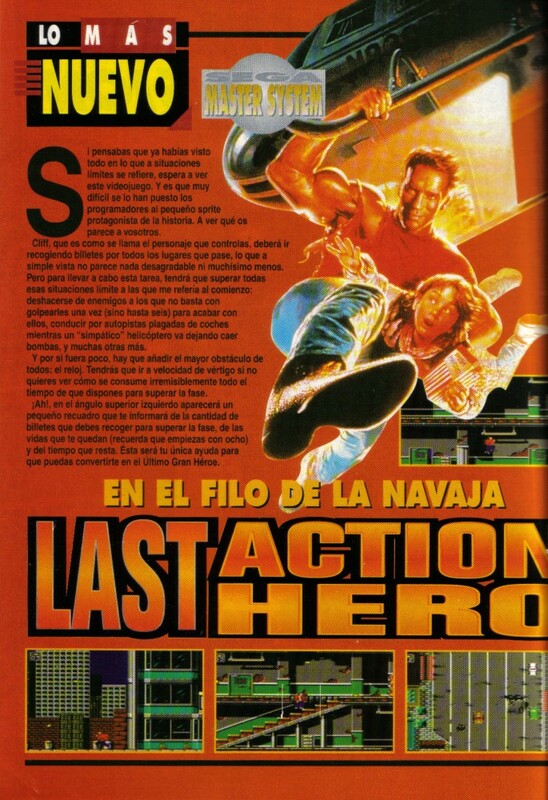 Only the MegaDrive version was released. Advertised for release (where?? ), and rumours of proto copies have circulated for a while. GameGear version was released. Listed as "Coming Soon" in "Les Jeux Master System 1992"
Compilation of 3 Dizzy games (Dizzy the Adventurer, Go! Dizzy Go! and Panic Dizzy). Bock has an early & incomplete proto. Complete version released on Game Gear. Confirmed by programmer Gil Espeche as being ported to the Master System as a test. 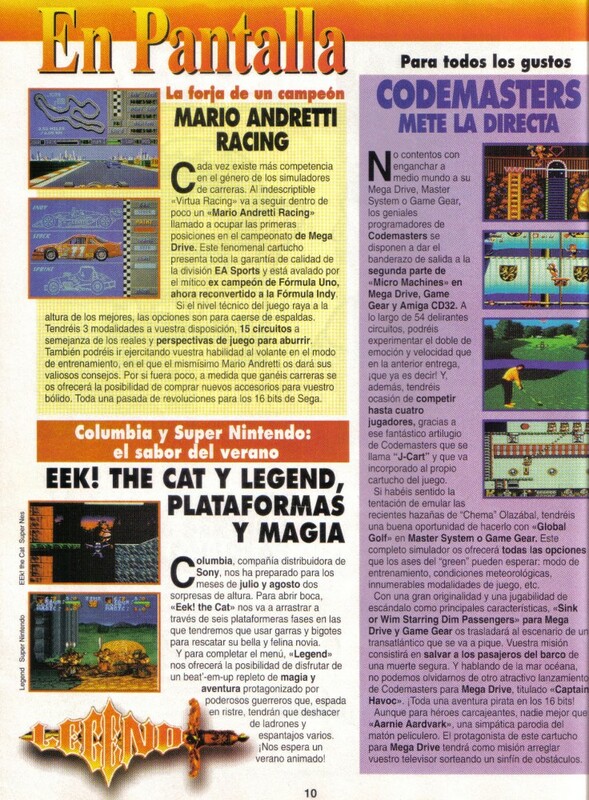 Listed as "In the pipeline" in Sega Power (July '94) and briedly mentioned alongside a screenshot in Spanish mag Hobby Consoles (scan). Possibly became 'Ernie Els Golf' on the Game Gear? The circulating ROM was provided by it's programmer, Mark Tailor. 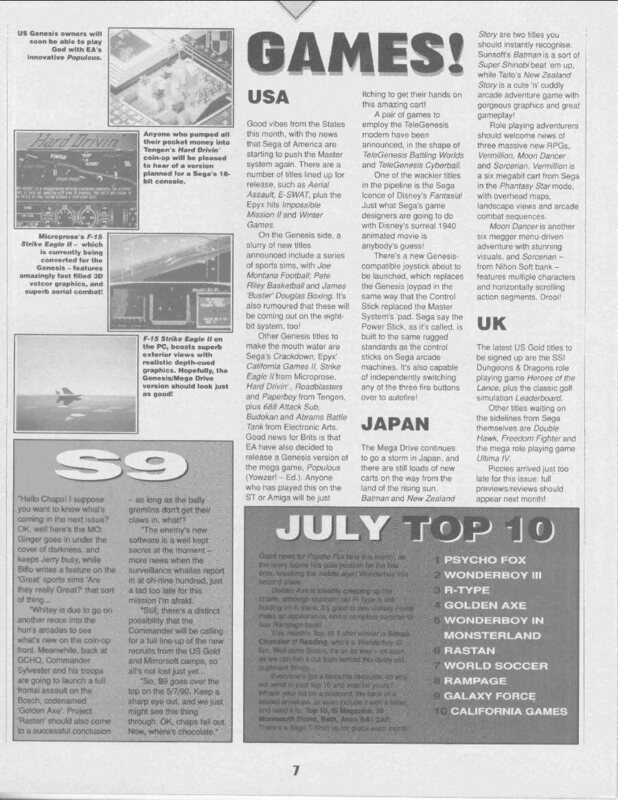 Listed as 'In the pipeline' in Sega Power (July 1994). Game Gear version was released. Mentioned in issue 8 of 'S' Magazine (scan). Listed as due for a March '94 release in issue 6 of Sega Master Force (12/93). GameGear version was released. Listed (inaccurately?) on the Olivers Brothers website as being developed by Interactive Studios (see here). A Game Gear version was released. Listed as being in development in issue 5 of Sega Master Force (11/93). A GameGear version was released. 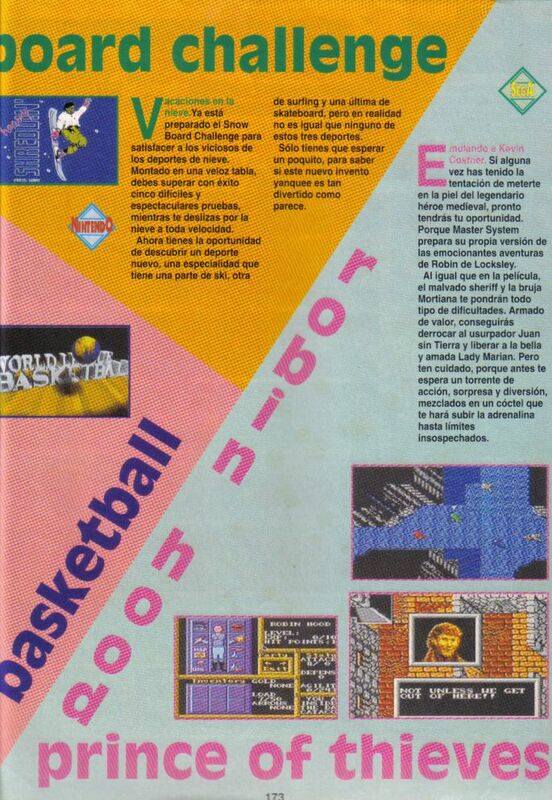 Reviewed by the Spanish mag 'Hobby Consoles' (scan: page 1,2) alongside several screenshots. Released on Game Gear. Confirmed as being completed by programmer Mark Tailor. 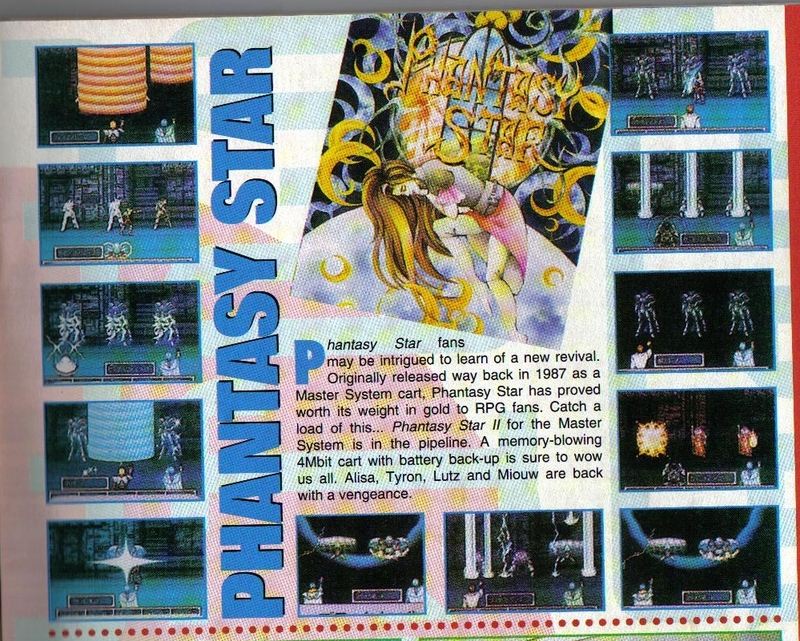 Reviewed by Sega Power (scan) alongside a couple of screenshots. Included on several older online lists of games, and appears on a list of SMS cheats compiled by Clint Dyer, presumably in error. This has been on SMS Rumour lists for years and was presumably mentioned somewhere, but I've no idea what the original source was. Discussed in an SMS Power thread as being included in a list of forthcoming Mark III titles in Japanese mag 'Gameboy' (Nov '87). 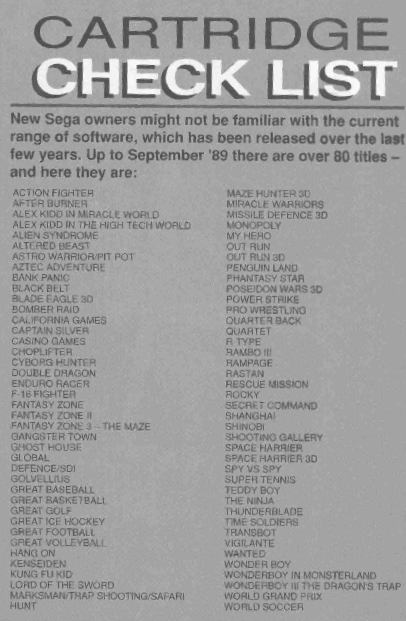 Listed as available in Sega Power (Summer 1995). Released on Game Gear. 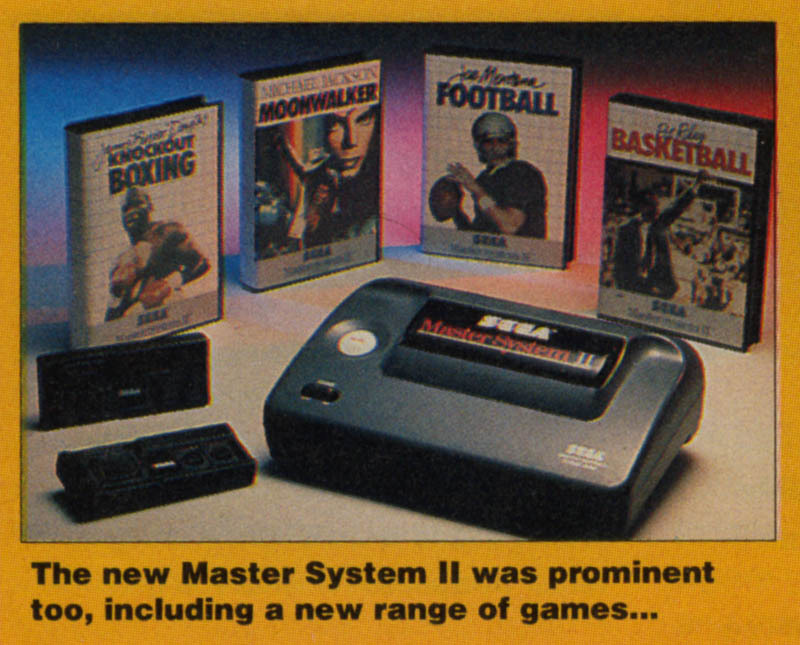 Confirmed by programmer Gil Espeche as being developed in Master System form aswell as GameGear. GG prototype has been dumped & released. Listed as "Coming Soon" in "Master System Les Jeux 1992-1993"
A listing on the Oliver Twins website suggests this was considered for stand-alone release before being compiled onto the (also unreleased) Excellent Dizzy Collection. A few protos are known, and the ROM is easily found. A pre-release box was shown in promo shots (scan 1,2). 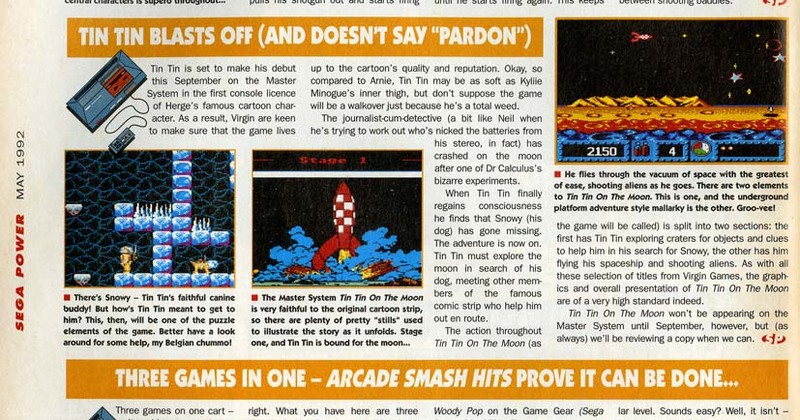 Included in a list of all released SMS games in issue 1 of 'S' Magazine (scan). Possibly refers to American Pro Football? Developed by DataDesign (see here). Game Gear version was released. Previewed in Joypad & Hobby Consoles magazines (scans: Joypad, Hobby Consoles 1,2) alongside a couple of screenshots. Previewed in issue 6 of Sega Master Force (12/93) alongside suspiciously NES-like screenshots. Fake-looking box shown in a magazine ad. Released on Game Gear. Released in Japan, but also advertised as Coming Soon in the US Spring/Summer 1987 Game Catalog Presumably canned when they decided to add Sports-Pad compatibility to the US Great Soccer instead. A looping 2-screen demo was shown at a 1989 US trade show (CES?) and later found it's way into Bock's hands. 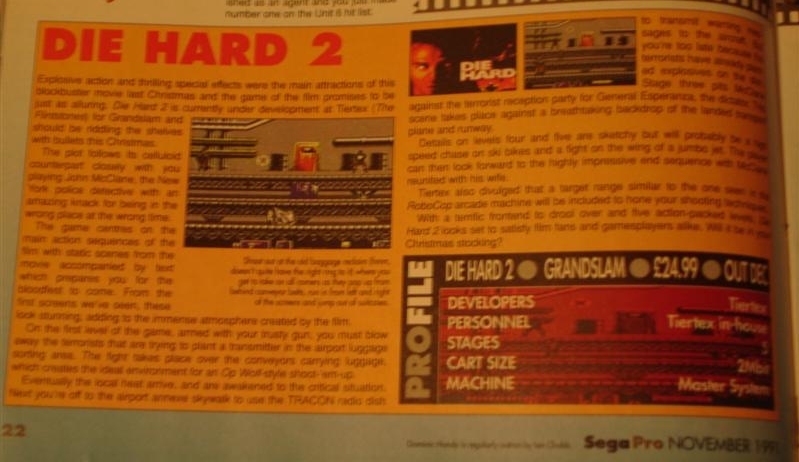 Mentioned in issue 7 of Mean Machines Sega (4/93) alongside a coupel of screenshots (scan). Combat & Rescue (Sega)	Listed as Coming Soon on the back of the "Take Hold Of The Sega Adventure" poster/catalog. Working title for Rescue Mission. 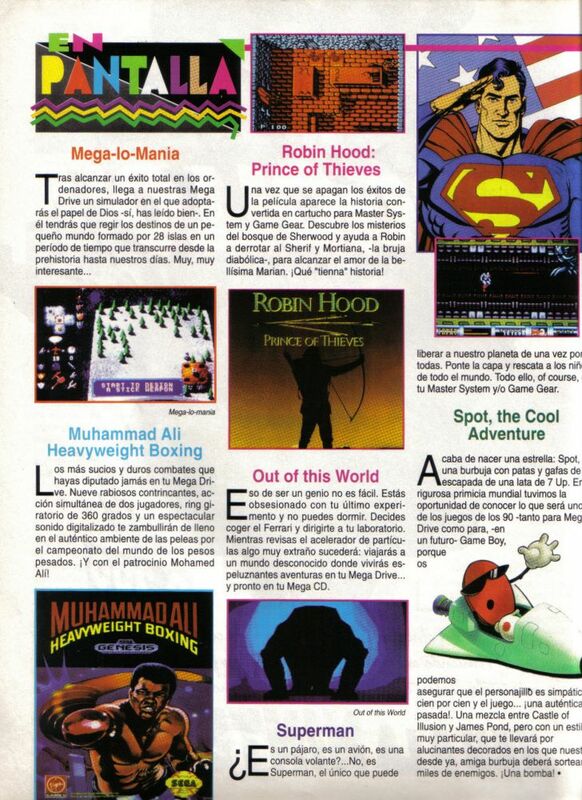 Freedom Fighter (Sega)	Listed as "Coming Soon" in 'S' magazine (Aug 1990). Working title for Aerial Assault. 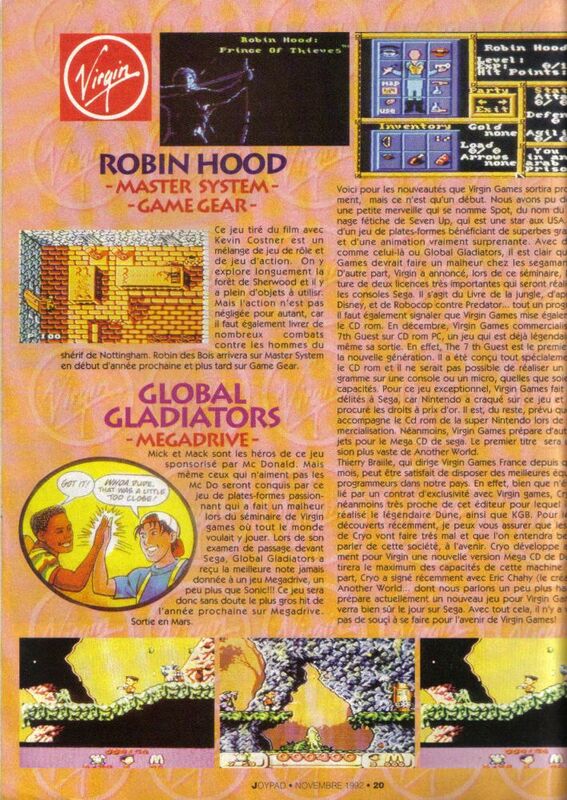 Listed as "coming soon" in the US Spring/Summer 1987 Game Catalog and in the UK 1987 Mastertronic catalogue. Working title for Missile Defense 3-D.